Do you need another VSTi? OH HELL YES! Version 2 of our angry old fart is out and he’s still mad as hell! 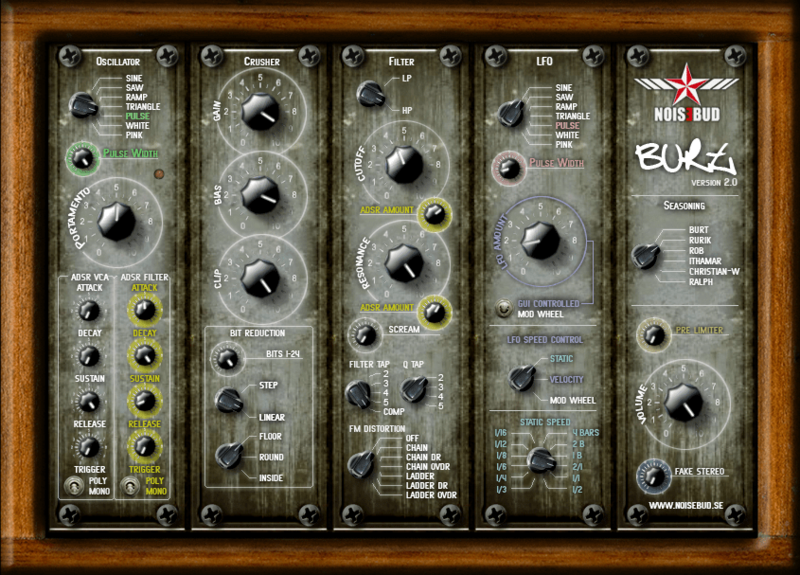 Burt are built around a traditional chain of subtractive synthesis but Instead of the traditional way with a nice and clean signal chain Burt adds distortion or exaggerate the signal in every step of the signal path. So even if you start off with a clean sine wave you might end up with something completely different and might even not hear any difference if you change to a saw or square. But be sure of one thing; it will sound like no other synth you heard before! Call it waveshaping or oscillation by distortion if you like… We call it Burt! New limiter that will save your ears and monitors. Fake Stereo (similar to our pHaase plugin). 2 different trigger modes for the VCA and VCF. Control the LFO amount with the Modulation Wheel. Control the LFO speed with the Modulation Wheel. 5 Additional seasoning distortion algorithms.